After visiting Colmar a couple years ago we decided we needed to come back again. When the opportunity arose last year to visit Colmar again with Angela’s family we jumped at the chance. This colorful little town in the Alsace region of France is a the Christmas capital of the world and visiting during the holidays is a once-in-a-lifetime experience! We couldn’t wait to show Ang’s family around this fairytale town. 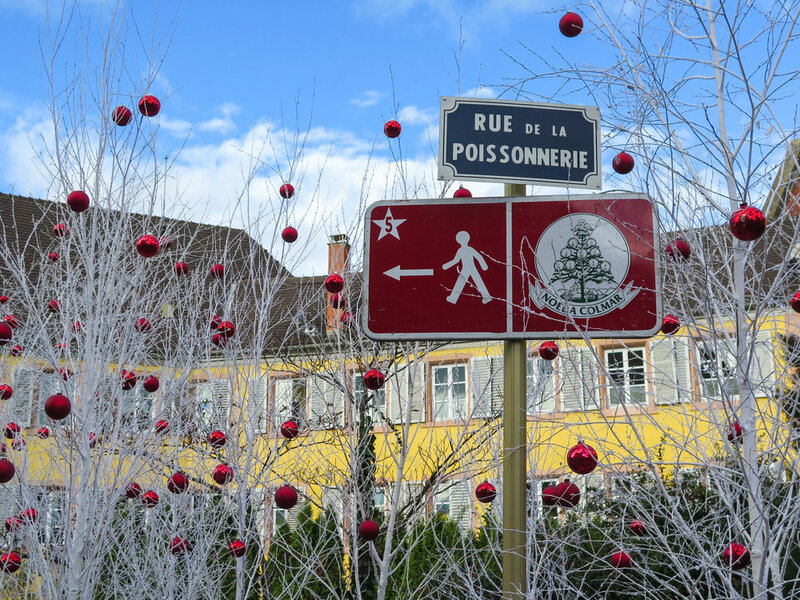 During the holiday season Colmar is a huge travel destination, and for good reason. With 5 Christmas markets scattered throughout the old town Colmar is one of the most festive towns in Europe and is easily accessible by train. 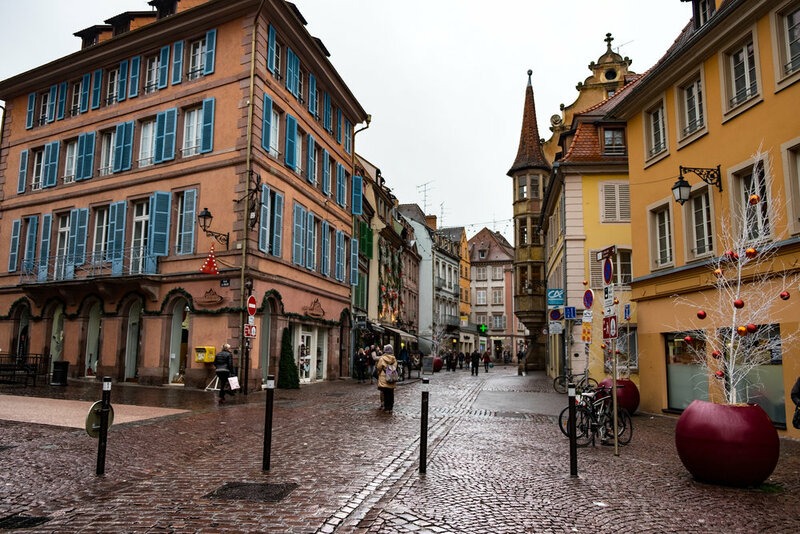 Right on the border of France and Germany Colmar shows signs of both cultures. Expect to taste French cuisine with German flavors. And see German architecture on the French building facades. The undoubtedly most colorful and picturesque area of town is called Petite Venice. Situated along the canals these brightly colored buildings look like different crayons in a box and the reflection of the canals below make you feel like you are in a real life fairytale. During the holiday season the Christmas markets in the old town are the main attraction. There are 5 Christmas Markets in Colmar. Each Christmas market is different and each stall sells it's own unique items. Christmas ornaments, decorations, meat, cheese, wine, chocolates, toys, candles, you name it! Grab a glass of vin chaud (hot mulled wine) to keep you warm as you stroll through these charming little markets. With or without all the Christmas decorations, the old town of Colmar is one of the most stunning villages in Europe. The streets are all cobblestone, which shimmer when they get wet from the rain and all the buildings are painted bright shades . The entire old town is a pedestrian only zone so you can slowly meander along the alleyways and take in all the quaint little corners of Colmar. There is nothing more magical than Colmar at night. When the sun goes down the thousands of Christmas lights around the town turn on. We promise you’ve never seen Christmas lights like this before. Lights are strewn across the streets, on the buildings, and along the canals in Petite Venice. The reflection on the water make the entire canals glow with light. TIP: Vin Chaud or hot mulled wine is a Christmas Market tradition. Buy a reusable cup for and take it with you as you sample different types of mulled wine from stalls across the town. There is white, red, and rose vin chaud. 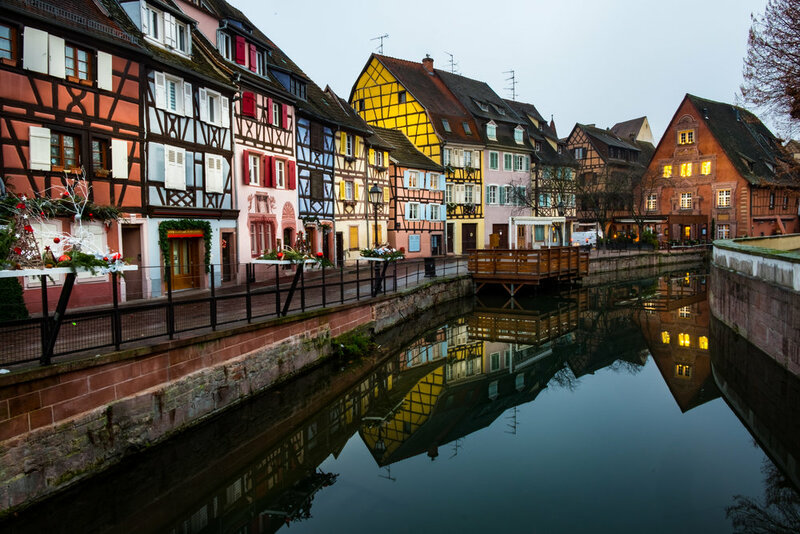 Only a short taxi ride away from Colmar are some of the most beautiful towns in France. One of our favorites is the tiny town of Eguisheim. This walled city has only cobblestone streets and no cars allowed. The cobblestone streets of Eguisheim at night. Spend an afternoon exploring the narrow alleyways, stopping to take photos of the beautifully colored building facades and don’t forget to stop for a glass of Alsatian wine at the local tasting room. 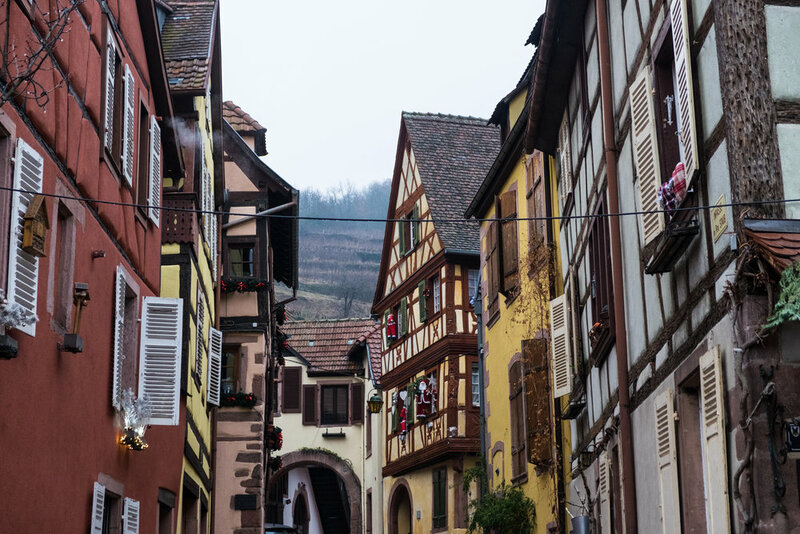 Eguisheim also has it’s very own Christmas market and it is as just as cute as you would expect in this quaint little town. The towns of Kaysersberg and Riquewihr are also nearby and and are worthy of their own day trip. Each of these towns have their own Christmas markets and are only a short car ride away. Constructed in 1565 on the city's original fortified walls, this 4-star hotel is located on the picturesque canals of Petite Venice. With a ton of history this is one of the most famous hotels in the old town. The rooms are small and outdated but the breakfast buffet makes up for it. With seating over the canal, fresh baked pastries, local cold cuts, foamy cappuccinos, and unlimited mimosas this buffet makes waking up in Colmar that much better. One of the most famous photos of Petite Venice is of the canals in the picture below. And in every photo the star is the Hostellerie le Marechal which is the tall green building. If you look close you can see the breakfast/dining area of the hotel along the bottom along the canal. We eat at this little restaurant every time we visit Colmar. It is always packed and very warm and cozy inside. You can find Maison Rouge tucked along the cobblestone alleyways and when you smell roasting meat you will know you found the right spot. The specialty of this restaurant is the roasted pork. You can see it spinning on a spit as soon as you open the door. This succulent pork is what keeps bringing us back time and time again. We love this covered market! To get away from the cold for awhile, slip into this market for a drink and some lunch. It’s located in the Petite Venice area and has some great cheaper food options. They have everything from cheese, meat, and produce to flavored salts, oysters and wine. They even have a stall that sells Christmas decorations, go figure! 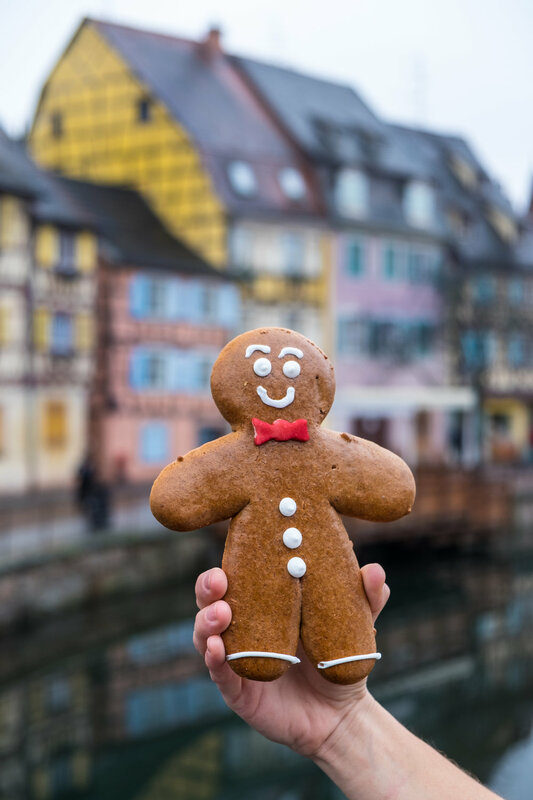 Some of the best food in Colmar comes from the quaint Christmas market stalls throughout the city. These little stalls have it all! Traditional Alsatian holiday classics like pretzels, spätzle, chestnuts, chocolates, candies and more! Our favorite’s were the warm pretzels with local cheese which goes great with a glass of vin chaud. 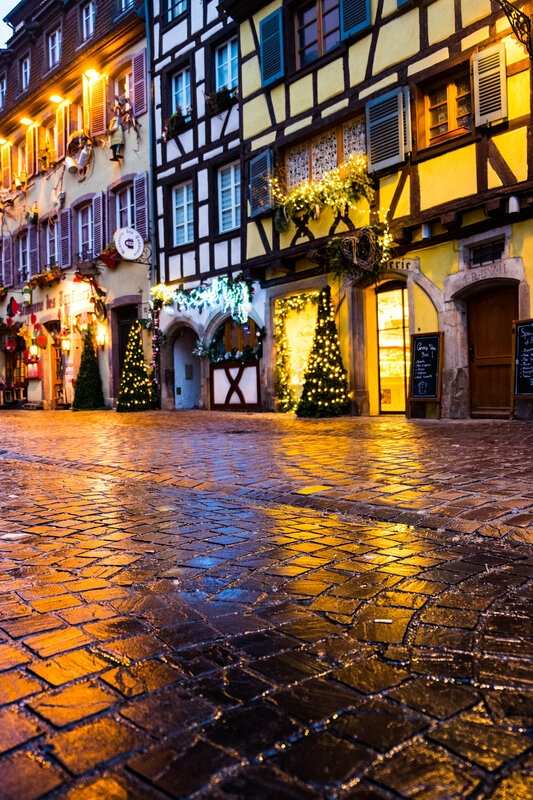 We love visiting this fairytale town in the Alsace during the holidays. It has to be one of the most festive places on earth during the holidays which is why visiting Colmar during Christmas should be on everyone’s bucketlist. Where do you celebrate the holidays?